Who is Fr. Sudac? He is a stigmatic priest approved by the Holy Father to give retreats. He prays for Healings and deliverance and has a special adoration to Jesus in the Blessed Sacrament. I have been on two of his retreats, and he came to our island in Croatia to give one, I came to know him personally as we hosted him when he was on the island of Ilovik. In his presence the heart and soul gets filled with many Graces that will stay with us through the difficult times in our lives. I can't describe the whole experience, since each person is unique and has their own needs which God fills with the Graces needed. All we need is an Open Heart! Reservations for the hotel need to be done by the end of February. Please send me a message or call me on my phone 1(308)765-5238 so I can hear your thoughts and answer any questions you may have. Upon arrival in Europe, change gates to board your short connection flight to Zagreb airport. Upon arrival in Zagreb collect your luggage in the baggage claim area, and continue to the arrival hall where you will be greeted by a tour guide and/or driver, who will take you to your hotel in Velika Gorica. Enjoy dinner before retiring for the evening. After breakfast, we will enjoy an excursion to Marija Bistrica. Marija Bistrica is the Croatian National Shrine of the Blessed Virgin Mary. The statue of Our Lady is from the 15th Century and it was standing in the church of the town Vinski Vrh. During Turkish aggression it was moved to Marija Bistrica and was walled up in one window. The statue was found in 1664 and after that numerous pilgrimages has started to Marija Bistrica. In 1923 Pope Pius XI granted the church the status of a minor basilica and in 1935 the archbishop of Zagreb Ante Bauer crowned the statue as Our Lady Queen of Croatia. 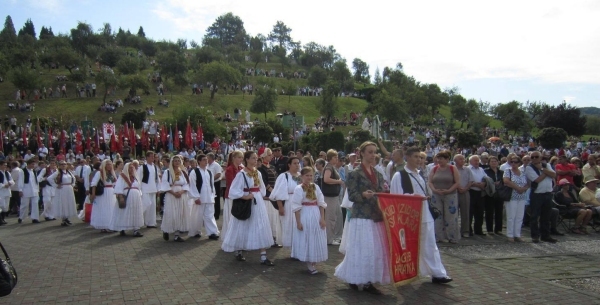 In 1971 the place was proclaimed a Croatian National Shrine. There are also beautiful stations of the cross in the shrine. Pope John Paul II visited Marija Bistrica 1998. We will continue on to Ludbreg. Today, we celebrate the Croatian National Feast of the Most Precious Blood. The miracle occurred in 1411 when the local priest celebrated Holy mass. During the mass the priest had doubts that in the chalice is really the precious blood and body of Jesus. At the time when the priest breaks the host in three parts, the priest noticed that there was a real blood in the chalice. Pope Julius II sent delegation twice to Ludbreg who got the testimonies of locals about the miraculous healings. Because Pope Julius II wanted to see the relic, it was sent to Rome and Pope permitted the public adoration of the relic. The Pope Leon X carried the relic in the priest procession in Rome and sent it back to Ludbreg. Since then Ludbreg was proclaimed a shrine. During the visit the group can see the relic. This morning we will depart for a tour of Zagreb – capital city of Croatia. We return to our first hotel in Gorica. This morning, we depart along the Adriatic Coast to the village of Medjugorje. Pending availability, we will visit Plitvice National Park listed in UNESCO's World Heritage list, with breathtaking scenery of this natural wonder of 16 terraced lakes, surrounded by thickly wooded mountains and lush vegetation. 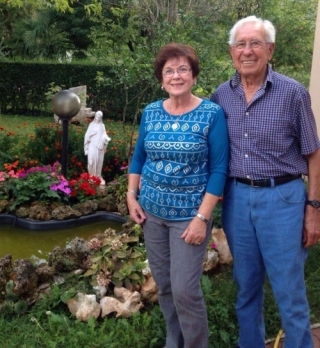 Upon arrival Medjugorje, enjoy dinner before retiring for the evening. Climb Mt. Krizevac (Cross Mountain): In 1933, the villagers built a 30’ high cross atop a mountain to commemorate Jesus’ passion and death on the cross. Your group will have the opportunity to climb this mountain, and venerate that very cross. When climbing, your group is invited to pray the Stations of the Cross (to meditate on Jesus’ suffering Road to Calvary), pausing fifteen times for each Station. 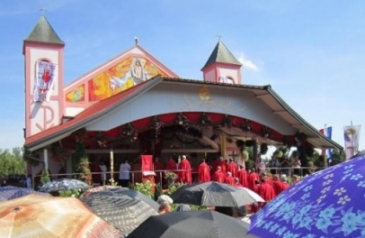 While in Medjugorje, you will have the opportunity to experience your faith grw, and share in the faith jou8rney of pilgrims from all over the world. Enjoy time on your own for reflection.